If you're a software developer you're probably already familar with HipChat and Slack. They are real-time messaging and collaboration tools used by many thousands of teams across the world today. The great thing about both platforms is that they allow other products and services to integrate with them, enabling companies to incoporate these tools into their existing process. We wanted Workflow to integration with our customer's processes - not the other way around. You shouldn't have to change how you work to use Workflow. Instead, Workflow should work the way you want it to. 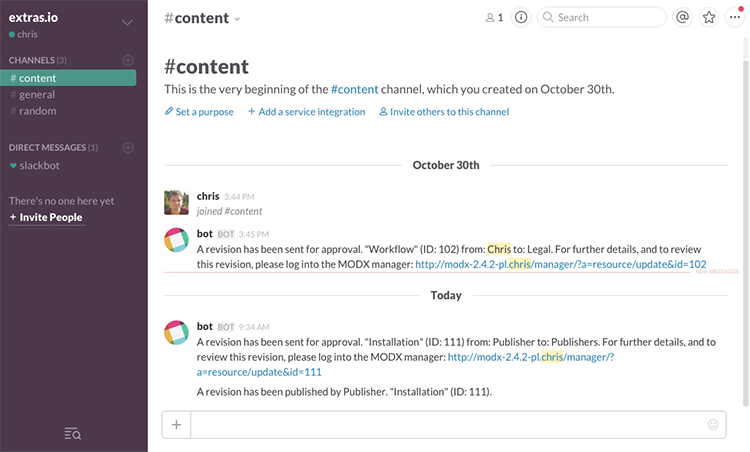 One way to do that is allow Workflow to push notifications and alerts out to the systems you use everyday, like HipChat and Slack. Of course you might use different systems altogther, so we've made it possible for developers to create their own plugins for Workflow with the OnBeforeRevisionWorkflowStep and OnAfterRevisionWorkflowStep system events. Importantly, both HipChat and Slack come as standard. So you can start pushing those alerts right away!